Like many other card games and casino table games like roulette, poker is a game with a rich history. I’d never played the game until a few months ago when I took a chance at this online casino I’d joined as players get the opportunity to join in freeroll tournaments. As I’d never played poker, I got beaten pretty quickly, but my first taste of poker gave me a fascination for the game, so I started reading up on its origins. Much of the early history of poker-like games is lost in time, but evidence has shown that similar games were played in ancient China and Persia. It’s said that the tenth century Sung Dynasty played a game like poker in China and in Persia, a game called As Nas goes back as far as the 16th century. It’s believed that the game that exists today is most closely linked to a French 17th century game called Poque. When French people travelled to America and founded the city of New Orleans, the game went with them, and then spread along the Mississippi river as it was played on river boats during the 18th century. In fact, the nickname for the fifth card – the river – is supposed to be linked to this period. According to legend, a poker cheat would conceal a good card up their sleeve and then switch it with a poor card to improve their hand. Anyone found cheating in this way would be thrown into the river for their trouble, hence the fifth card’s nickname. As people moved west in the USA, so the game of poker travelled with them, and it’s why poker history has a lot of associations with the Wild West. 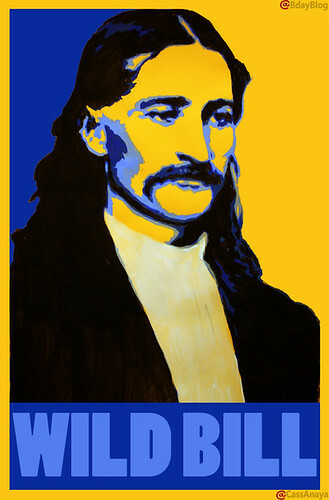 Wild Bill Hickcock was a gunfighter who was shot dead during a poker game in the Nuttal and Mann’s Saloon Number 10, Dakota Territory in 1876. The hand he was holding as he fell to the table – two black eights and two black Aces – has long been referred as a Dead Man’s Hand by poker players. For many years, the most popular game of poker was Stud Poker, but in recent years Texas Hold’em has become the number one poker game worldwide. Texas Hold’em gained iconic status from the 1970s when it was the game used in the World Series of Poker. The World Series of Poker has ensured poker’s pre-eminence as a worldwide favourite casino card game. It’s an annual tournament that poker professionals from all over the world take part in. Since 2003, the World Series of Poker has been hosted exclusively by Harrah’s Casino, though the venue changes from year to year. The great thing about poker going online is that everyone can get to play it – for as little or as much as they want. There’s no need to book out an entire evening or weekend, you can just join a sit n play game whenever you feel like it. Watch out though, you could be up against some serious competition and you won’t be able to judge this until the game’s in play!